We offer customized rates for commercial clients to ensure your trees and hedges are safe and beautiful for an inviting and professional look! We understand every job is unique and needs to be gone threw thoroughly. At Lumberjack Clearing we can ensure a sharp clean look as well as proper professional practices to ensure long lasting healthy trees. Forest fires happen, and they happen fast! Fire mitigation is a cheap precaution to help ensure the safety of your home, anchorage, park, etc. Removal of fine fuels and coarse woody debris as well as dead trees and branches is the first step to keeping your land fire free! We offer hand cutting crews for Power line, Right of ways, Seismic lines and much more all over BC. Certified tree fallers and buckers available at competitive day rates. 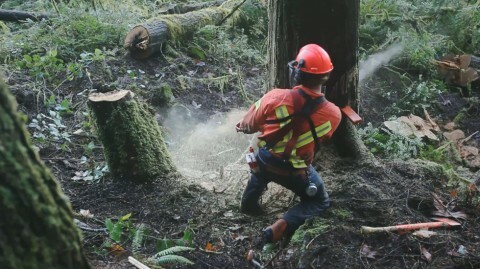 Hand falling is a dieing art form but is key to a successful logging operation. Lumberjack Clearing offers hand fallers at competitive day rates for selective timber falling on steep slopes and soft areas logging equipment can't access.